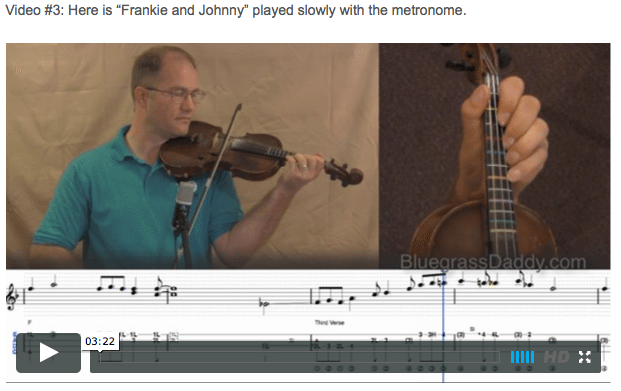 This is an online fiddle lesson for the tune "Frankie and Johnny." This is by special request for my friend Bob Betts. 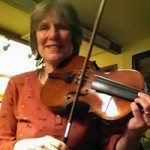 Video #1: Here is a video of me performing the fiddle tune "Frankie and Johnny." This is an improvisation on "Frankie and Johnny." Afterwards, I tabbed these three parts if you would like to learn what I play here. "Frankie and Johnny" (sometimes spelled "Frankie and Johnnie"; also known as "Frankie and Albert" or just "Frankie") is a traditional American popular song. The song was inspired by one or more actual murders. One of these took place in an apartment building located at 212 Targee Street in St. Louis, Missouri, at 2:00 on the morning of October 15, 1899. Frankie Baker (1876 – 1952), a 22-year-old woman, shot her 17-year-old boyfriend Allen (also known as "Albert") Britt. In 1899, popular St Louis balladeer Bill Dooley composed "Frankie Killed Allen" shortly after the Baker murder case. The first published version of the music to "Frankie and Johnny" appeared in 1904, credited to and copyrighted by Hughie Cannon, the composer of "Won't You Come Home Bill Bailey"; the piece, a variant version of whose melody is sung today, was titled "He Done Me Wrong" and subtitled "Death of Bill Bailey." 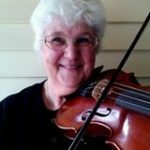 The song has also been linked to Frances "Frankie" Stewart Silver, convicted in 1832 of murdering her husband Charles Silver in Burke County, North Carolina. Unlike Frankie Baker, Silver was executed. This topic contains 23 replies, has 9 voices, and was last updated by John Cockman 1 year ago. This lesson is by special request for my good friend Bob Betts. I did this lesson a bit differently. 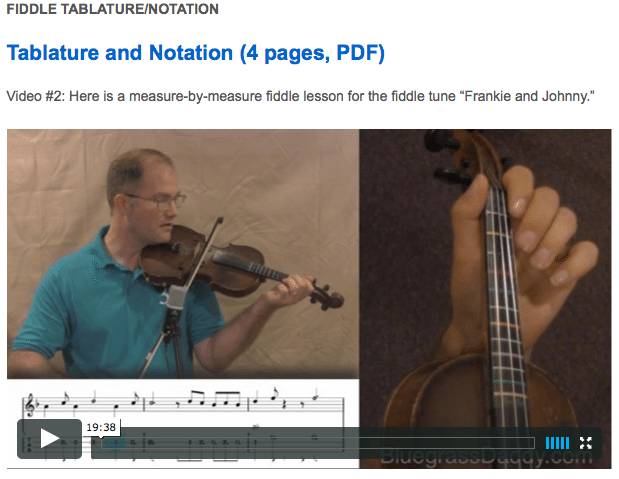 I improvised on the performance video, tabbed out the parts that I played and then taught the lesson. Hope you enjoy! Very nice! Thanks for this: I need to learn to play in something besides G D and A…here’s a great chance to start! Good idea! I’ll go ahead and put my request in for Daly’s Reel and President Garfield’s Hornpipe, both in Bb. Oh my, oh my, oh MY!!! John …. I have watched you play so many tunes on your Youtube channel and quite a few tunes here on BluegrassDaddy … but my,oh my …. this would have to be your best one EVER! If you don’t mind me saying the following: I would like to say that you imbued every bit of your heart and your soul into each and every note you played! And when you neared the end, you just seemed to become one with the music and loose yourself in another dimension! It gave me chills as I was transported to that other dimension with you as I watched and listened to you play. You appeared to enter that illusive place that many musicians sadly can only ever dream of. Man!!! I can’t stop watching this vid! Awesome experience, my friend! Simply AWESOME!!!! Scott, you are making me blush 🙂 Thank you my friend, I am glad you enjoyed the music. It is so easy to get lost in a song like that one. Sometimes I get a feeling like I could play a tune for hours and still be exploring and learning new things about it. It really is a great feeling! John, I just found this lesson and listened to it, and that’s what I mean by magic. I really must learn how to do that, and appreciate you tabbing out the improv — this is _exactly_ what I was talking about over in the Whiskey thread. At least we have a shot at copying what you’ve done, but… (you can see this question coming, right? :-)) can you teach us how to _create_ those notes in our mind (via rules, principles, etc), even if we can’t play them all. What wonderful playing. It was beautiful. The question of “why” is absolutely valid. Mimickry is not as inefficient a learning method as you might think, but still there is something in all of us that wants to know why we do what we do. I have had a gig every evening this week, but now I have tonight (Friday) night and all day Saturday to get caught up on tune requests. After that, I have some good ideas for teaching improv that I will try to get into video form, hopefully very soon. John, I just want to ditto Scott’s words!! I have watched this performance lesson many times over but have just noticed the comments now. Scott your every word is exactly how I feel about John’s playing. Love the way you play this! I wish I could express myself the way Scott did in describing it. It’s interesting to note that you can move over a string to start playing B flat when you’ve been playing in F.
I benefit very much from the juxtaposition of your vocal explanations, frontal playing, birds-eye hand view ,notes and tablature with the little blue ball bouncing along. This is unique to your lessons. The song is beyond me now, but I’m going to start on it. Thank you, John! John, for some reason, this song is not listed under your “Recent Lessons”. Kevin, I apologize for not seeing this message until now! I blame the Christmas rush! I guess that only illustrates the need for my new system of flagging unread posts. I am loving it! Hopefully it is a nice improvement to the forum. I am working on it! 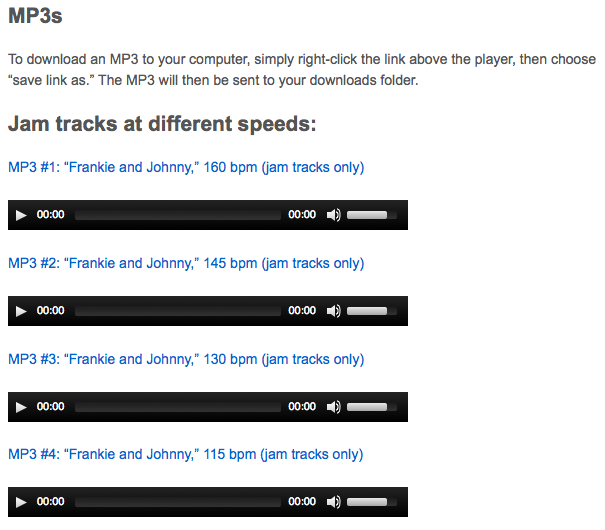 I have added the video audio to the MP3 list above. Thank you for suggesting that! That would be very helpful! My newest thing is a vertical bar to the left of the forum description that changes from gray to dark blue if there is a forum that has seen activity since your last login. 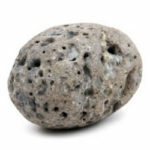 WOW John, Love what you have done with the place. That will make it so much simpler. Thanks again for the change bars, they really help. They are already saving me some time! And thanks for the heads up on the typo. You were right, it was a copy-paste error. John, I listened to you playing Frankie once again (for the hundredth time), and — wow, your playing never stops amazing me. I really, really must learn to play this piece when I get done my current projects. What wonderful playing. It just amazes me. Thanks Kevin, that means a lot. Man, I feel bad, I have a string of lessons virtually ready to go on improvisation; I am just so far behind. I am getting my feet under me, though, and planning to really get some stuff done at BGDU this semester. Thanks John. 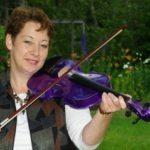 Your improvisation on this tune is what attracted me to the site. You sound fabulous on the video..!! This reply was modified 1 year ago by John Tait. Thanks John. I would like to do more like this — perform an improvisation then teach it while explaining my thought process.